What Are the Bright Spots and Hexagonal Craters On Mysterious Ceres? 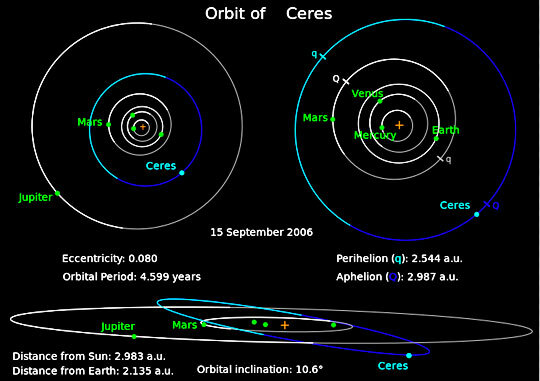 Ceres is near the rocky asteroid belt between Mars and Jupiter, but round and so is called a dwarf planet. It is small, only 590 miles in diameter, with a surface temperature of minus-105 degrees C. (minus-157 degrees F.). Yet, it's estimated to be 20% water ice and some scientists think that the bright spots could be fresh ice somehow ejected from below the surface. Feb. 19, 2015 image by NASA/JPL. Ceres is 514 million miles (2.77 astronomical units) from the sun around which it revolves every 4.61 Earth years in a nearly circular orbit. A day on Ceres is 9.1 hours. Ceres was the first object in the asteroid belt to be discovered in 1801 by Giuseppe Piazzi, who thought it was a new planet because it was round. Ceres is not like the rocky asteroids and in 2006, the Astronomical Union decided to classify Ceres as a dwarf planet, small and round. March 27, 2015 Pasadena, California - On February 19, 2015, the NASA/JPL Dawn spacecraft was 28 thousand miles from our solar system's dwarf planet Ceres near the asteroid belt between Mars and Jupiter. 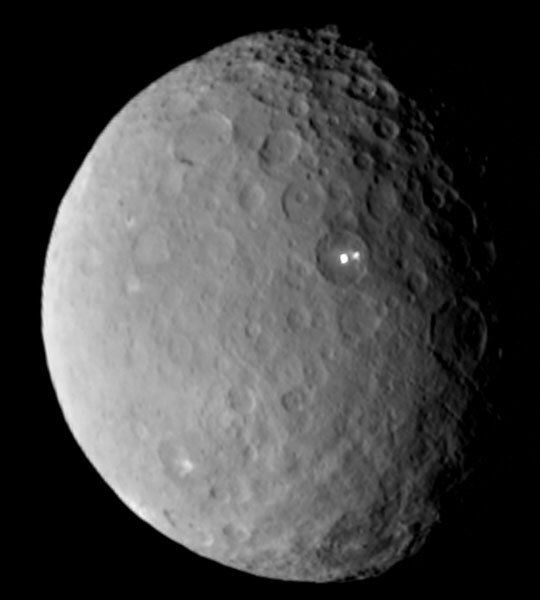 Ceres is in the small planet category because it is so round. Asteroids are not round. They are jagged rocks. Also, Ceres is only 590 miles in diameter made of 20% water ice with a surface temperature of minus-105 degrees Centigrade. That's a very cold minus-157 degrees Fahrenheit. One of Ceres's many mysteries is what dense ingredients came together at the beginning of this solar system that would have enough mass to form such a small, round ball that might even have a thin atmosphere? Next PostNext Update April 1, 2015 – U. K. MoD Delays Once Again Release of 18 Classified UFO Files Admittedly Withheld in FOIA Correspondence with Retired USAF Tech Sgt. John Burroughs.